Swiss-Belhotel Seef Bahrain is a 4-star international hotel, recently awarded the “Best four-star hotel” and “Hotel of the year” titles at the prestigious Bahrain 2018 Food & Travel Awards. The hotel provides superior quality facilities and high standards of service and is located in Bahrain’s central business and commercial district and only a 20 minute drive from Bahrain International Airport. The hotel is in close proximity to both Seef and Bahrain City Centre Malls, two addresses recognised for being Bahrain’s community landmarks. At 28-storeys tall, Swiss-Belhotel Seef Bahrain offers ideal accommodation for business and leisure travelers in the Kingdom of Bahrain. Both guest rooms and public areas boast breathtaking panoramic ocean and city views. The hotel offers a wide range of uniquely-designed features and facilities, including large guest rooms and suites, a fully equipped gymnasium and pool area, as well as extensive banquet and specialty dining venues. Swiss-Belhotel Seef Bahrain features 144 guestrooms including Superior, Deluxe and Junior suites, all with a modern, contemporary design. The hotel provides varied accommodation, dining and meeting facilities to ensure a truly welcoming environment for both business and leisure travelers. A delightful International and Arabic buffet breakfast, and à la carte menu, is served at the Swiss-Café, with an all-day dining restaurant and outdoor Panoramic Terrace located on the 10th Floor. There is also Cafeccino lobby café, which offers a selection of salads, sandwiches, pastries, cocktails and mocktails throughout the day. For business delegates, the hotel offers up-to-date conference and meeting options with three meeting rooms and a ballroom with a capacity of up to 250 guests, to accommodate the needs of each business or private function in Bahrain. Meeting rooms are fully equipped with modern facilities and state-of-the-art equipment making the hotel ideal for hosting exhibitions, seminars, conventions, weddings, gala receptions, private receptions and product launch events. Our top of the line fitness centre, outdoor swimming pool and Spa are the perfect place to rejuvenate your body and mind. Stay in touch with all the latest news in Bahrain. Swiss-Belhotel Seef Bahrain features 144 guestrooms including Superior, Deluxe and Junior Suites, all with a modern, contemporary design. A delightful International and Arabic buffet breakfast, and à la carte menu, is served at the Swiss-Café Restaurant in Bahrain, with an all-day dining restaurant and outdoor Panoramic Terrace located on the 10th Floor. There is also Cafeccino lobby café, which offers a selection of salads, sandwiches, pastries, cocktails and mocktails throughout the day. 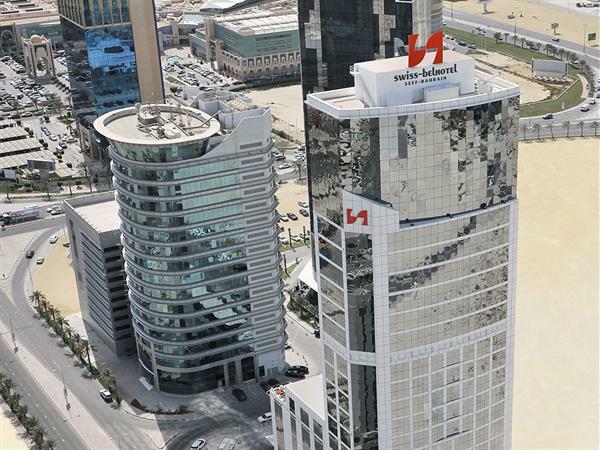 Swiss-Belhotel Seef Bahrain provide services and hotel facilities such as Business Centre which offering a range of professional secretarial and administrative services, broadband internet access, concierge assistance, 24 hour in-room dining, and laundry and dry cleaning services. A spacious indoor car park and valet service are also available.